If you’re a health-conscious eater on the hunt for a reliable and fabulous healthy dessert cookbook, you must try “Rawsome Vegan Baking” — an UNcookbook for raw, gluten free, vegan treats by local gal Emily Von Euw. Ridiculously delicious cookie, cake, bar and cupcake recipes — none of which require an oven — fill the book’s pages. To get started, all you need is a food processor, a fridge and of course the basic baking tools. 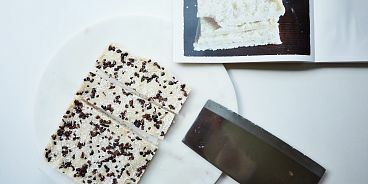 My favourite recipes so far are Emily’s “Crazy for Coconut Bars” which are simply made with shredded coconut, coconut oil and maple syrup. They’re a perfect quick yet impressive dessert if you’re in a pinch. Another winner is her Avocado Mint Cream Bars with Chocolate.